This special Summer–Fall 2013 double issue of Communio takes up various aspects of the question of religious liberty. "The province of the Church is the world." "We have all heard quite a bit about the dictatorship of relativism. Perhaps it is time that we also discuss the despotism of tolerance." 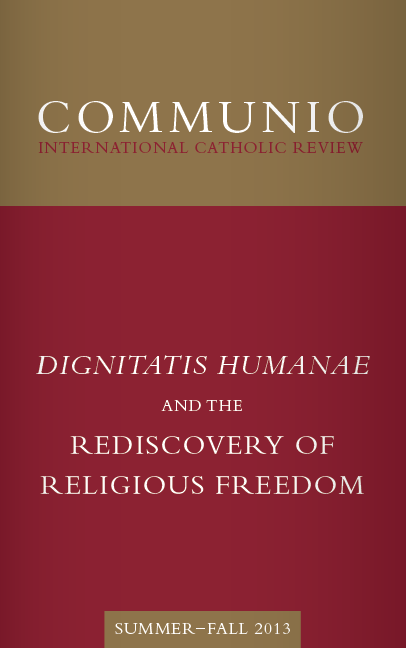 "Dignitatis humanae had a rough passage through the rocks and shoals of conciliar politics, the effects of which may still be seen . . . [but it has had a] complex, and sometimes unforeseen, impact on both Church and world." "Despite the pressure of ideologies and political systems . . . the Pope called on us never to lose heart for the good of man and society." "We are facing a radical change of civilization." "[T]he centrality of religious freedom to the protection of human dignity is, in fact, key to the coherence and viability of the entire human rights project." "The first Christian cultural revolution is precisely the Christian whose existence is held together and moved by the love of Christ."